In 1926 Rolex made the first waterproof watch case and happens to call them boxes Oyster “Ostra” from entoces always been a brand that has taken great care of their watches leakproof, water was the enemy number one of the gauges and the creation of these boxes was a breakthrough and salvation for many clocks today still have a good seal. To manufacture a dive watch the first tests were conducted by Dimitri Rebikoff with a prototype model called Deep- Be Special, as the Moana mythical expeditions, Antarctica or Ra II were the stage for these tests. In 1953, Rolex released a diving watch, the Submariner, a watch and bracelet with box WR100m made entirely of stainless steel. Some photos that appear in this review are not mine, but I will bring quality to the review for future reference. I’ve been looking online more technical information and best photographs to do something more complete and well put together everything you can, since the clock so I could see and photograph to my dealer and the light conditions and the stage were not the most appropriate to get a good profit model. Eduardo of us spent the Swiss Union official CD press kit supplied by Rolex, there we have good pictures and technical information that is available to us in PDF format which I used many things . 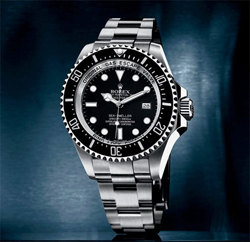 In April 2008 presented at Baselworld “the Basel fair,” a new diving watch, the Sea Dweller DeepSea, a diver to end with a leakproof tensile, 3,900 meters, a clock entirely new feature of the image Rolex divers but with an important technical improvements and ingress unusual for mechanical watches. After having one in my hands being able to fondle, take measurements and take pictures I take to make a review of the Rolex Sea-Dweller DeepSea reference 116660 , the most radical diver replacing the previous Rolex Sea-Dweller 4000 ref.16600. KIT Supplied with a white cardboard box inside contains the typical green box fully lined with a high quality appearance. Accompanied as usual using the manual, the warranty, chronometer certificate, the leather purse and red seal certified COSC. In this model the box is a little bigger and wider, and the outer carton is cut from the front to easily remove green case. As a general rule of Rolex watches to build their oyster case used, this is made from a solid block of steel, the boxes are subjected to more than a hundred for manufacturing operations, and year after year to ensure absolute waterproofness and protects the movement in the most extreme conditions. The stainless steel used is 904 L in order to meet the demanding criteria of Rolex. 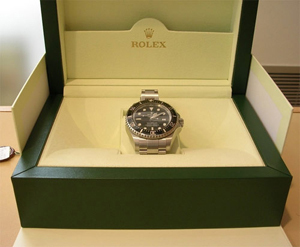 Thickness of the box without the lid and the glass is 8mm, and cover the complete watch is 17mm including glass, a little as normal what we were used Rolex, but of course is a dive watch about 4,000 meters and this could not be achieved without a box of these characteristics. The bottom of the box is made of a titanium alloy, a material extremely resistant steel, and is held against the ring by another steel ring. The handles that hold the bracelet in this model are wider in contrast with the usual subs, this model are very similar in size to the current ceramic bezel GMT Master and no side holes to extract the bracelet. CROWN of winding Triplock threaded joints has won three in size and now measures 8mm (1 mm more than the previous model) providing a good touch and clock management. The three dots characteristic of triple board are also visible in the crown. Here unscrewed and pulled up at a stop and start of the second hour. The helium valve is made of high strength stainless steel and its size is adapted to the dimensions of the box that offers optimum sealing. A great depths, professional divers use pressurized chambers where between one dive and one breathe a mixture of High pressure gases, including helium, and as volatile gas that can be cast on the clock. In the decompression stops during the ascent, the helium valve serves as a safety device. The DeepSea is equipped with a unidirectional rotating bezel with 120 positions disc Cerachrom black and graduation of 60 minutes which allows the diver to dive time reading accurately. The material on this bezel and mounted for the first time in the GMT Master and is an extremely hard material with excellent corrosion and wear. Ultraviolet rays do not affect its color and is virtually scratchproof. The numbers and rankings are obtained by a deposit of platinum applying a PVD technique patented by Rolex. The zero graduation, represented by a triangle, is visible longer at night or on the seabed by a capsule containing a new luminescent material that emits blue and bezel protrudes slightly. To resist pressure, the synthetic sapphire crystal is slightly curved and is much thicker than that of the other models oyster and bears against the inner ring, carries no antiglare treatment. Always been criticized especially the bracelet and closures or extent of diving Rolex watches are very simple and does not convey the image representing the brand ..
At this point in the DeepSea has been made radical change, is a masterpiece of engineering: is made of solid stainless steel 904L, the bracelet of DeepSea to set the clock on a diving suit up to 7 mm thick thanks to a double length adjustment system consisting of links Extension Fliplock and resealing Glidelock fine adjustment very effective and easy to operate. Here the inside where the extension to suit folded position for normal use. On the right we can see the extent to wetsuit folded stretched but still contains 3 rooms. On the left and the extension is fully elongated, has a plate more than the previous Sea-Dweller. Earlier models had a few holes in the box where you could make a Micro with a punch, holes were not very aesthetic and other models like the Daytona have the widest box and microregulation is done from the inside, but always with a punch. This model is much easier to adjust without tools: in seconds with a simple operation and adapt it to your wrist or adjust it over wetsuit.